APVO210 is a bispecific antibody candidate built on Aptevo’s ADAPTIR therapeutic protein platform. It is designed to modulate and suppress pathological immune activation without lymphocyte activation by selectively delivering a modified form of IL-10 to antigen presenting cells via CD86 without stimulating IL-10 responses on resting and activated lymphocytes. APVO210 has potential utility in the treatment of a broad spectrum of autoimmune and inflammatory conditions, such as psoriasis, inflammatory bowel disease, rheumatoid arthritis, graft-versus-host disease, lupus, as well as other diseases where there is antigen-driven activation of T lymphocyte-mediated disease. One of the distinguishing features of APVO210 is its ability to selectively promote immunosuppression without activating immunostimulatory cytokines. Cytokines function by promoting or suppressing a variety of cellular functions, including inflammatory responses. Unregulated inflammation is believed to be responsible for a variety of chronic and acute inflammatory and autoimmune disorders. In particular, the cytokine IL-10 is known to play a key role in suppressing inflammation and has been studied extensively by other companies in different clinical trials for autoimmune and inflammatory disorders. Unfortunately, the results of these studies have been disappointing. This may be due to the undesired stimulatory properties of IL-10, which exerts stimulatory effects on lymphocytes, promoting B-cell proliferation, immunoglobulin production and cytotoxic T-cell function, thus potentially reducing its overall therapeutic utility for immunosuppression. Aptevo believes that APVO210 improves the anti-inflammatory properties of IL-10 in two ways. First, by specifically targeting cells expressing CD86, such as monocytes, macrophages, and dendritic cells, and second, by eliminating the undesired stimulation of lymphocytes, including resting and activated T and B lymphocytes expressing the IL-10 receptor. It is this absence of lymphocyte stimulation associated with APVO210 which Aptevo believes may reduce the toxicities previously observed in other companies’ clinical studies testing repeat administration of IL-10 in humans. More than 80 different types of autoimmune diseases have been identified. Some, such as Type 1 diabetes, multiple sclerosis and rheumatoid arthritis are well known. Others, however, are rare and difficult to diagnose. Collectively, autoimmune diseases are among the most prevalent diseases worldwide, and in the United States, are estimated to affect more than 23.5 million people while globally, autoimmune diseases are estimated to affect between 350-550 million people. APVO210 stimulates the IL-10R on monocytes and dendritic cells, but not on resting or activated T and B lymphocytes in vitro. APVO210 shows potent in vitro responses including blockade of T-cell proliferation in human mixed lymphocyte reactions and inhibition of LPS-induced cytokine release by monocytes. 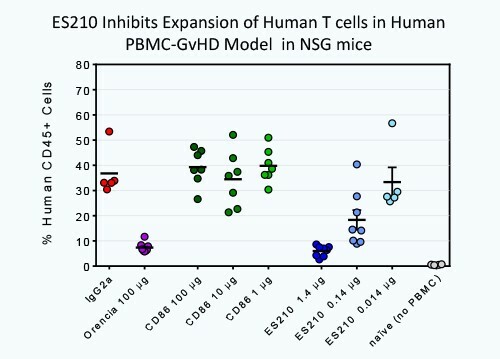 In vivo, APVO210 blocks T-cell expansion in a humanized murine graft-versus-host disease model. APVO210 was well tolerated when administered to non-human primates and has a half-life similar to monoclonal antibodies.